Lavender Ranch™ Hand & Body Lotion uses ingredients grown, harvested, and distilled at our Lavender Ranch in Biggs, California. This brilliantly versatile lotion is unique. The organic ingredients fight signs of aging and cellulite. 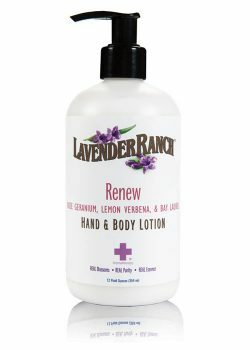 An all natural formula which produces a silky light and creamy feel, while reducing inflammation & puffiness of the skin. These all natural agents will keep your skin healthy. A great choice for acne control and reducing muscle pains and spasms. Infused with protective plant oils and emollient-rich moisturizers which will aid in boosting your immune system. Created using Essential Oils & Extracts, this combination of ingredients will hydrate, nourish and protect your skin. Including, reduce water retention and swelling and promote general health and well being. Available in five different formulas which will refresh you mentally as well as physically; Invigorate, Refresh, Renew, Soothe and Lavender. A perfect assortment to help combat the daily effects of life, these are lotions that you can’t go with out.